Mirrors are widely used in residential home staging because one of the goals is to have the home look as spacious & bright as possible. Kind of a trick of the trade. 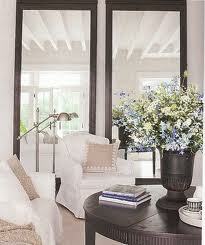 Large mirrors are my favorite…the kind that almost go floor to ceiling. You may think that you do not have space for something as big as that, but when you see what it does for your room, you may find a way! 1. 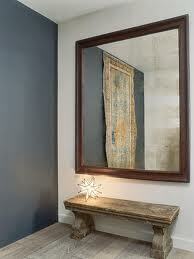 Mirrors can widen a narrow room or hallway, creating the illusion of space. 2. 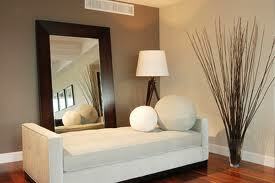 Mirrors reflect light and make a room brighter when placed across a window or next to a bright lamp. 3. 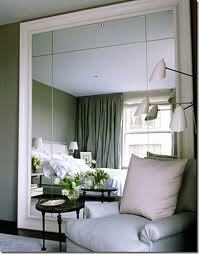 Mirrors reflect beautiful views and artwork positioned on surrounding walls..
4. Mirrors can be works of art in themselves. 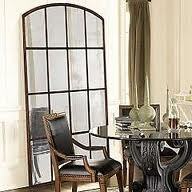 Select a frame that compliments the room’s decor to make the mirror an integrated part of the design. 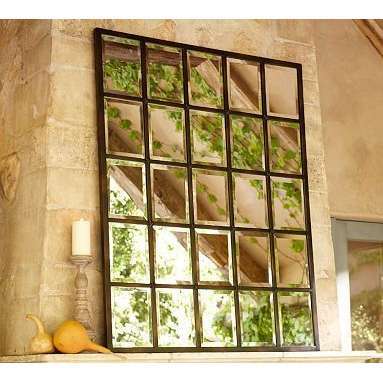 The interesting shape to this mirror gives the illusion of a window being there! So, what are you waiting for…go get yourself a mirror!